Greetings & Salutations! 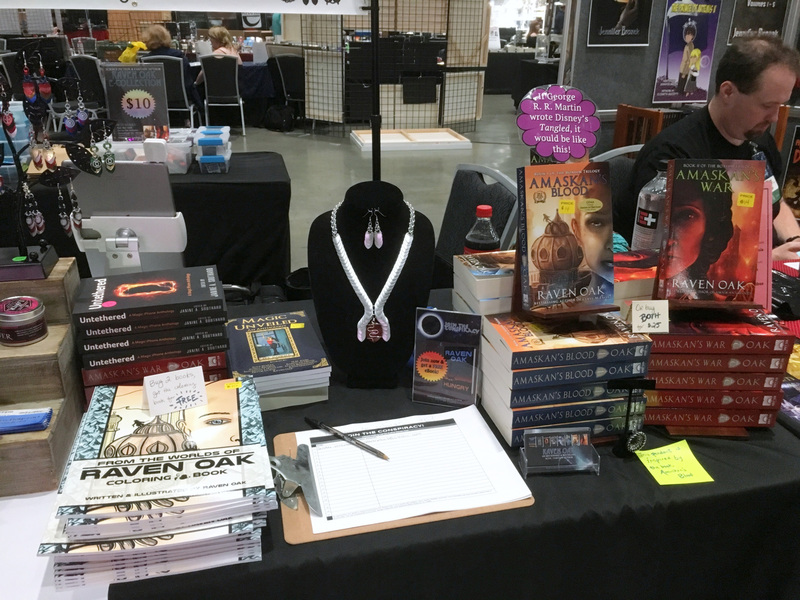 This is your WorldCon Wrap-Up! 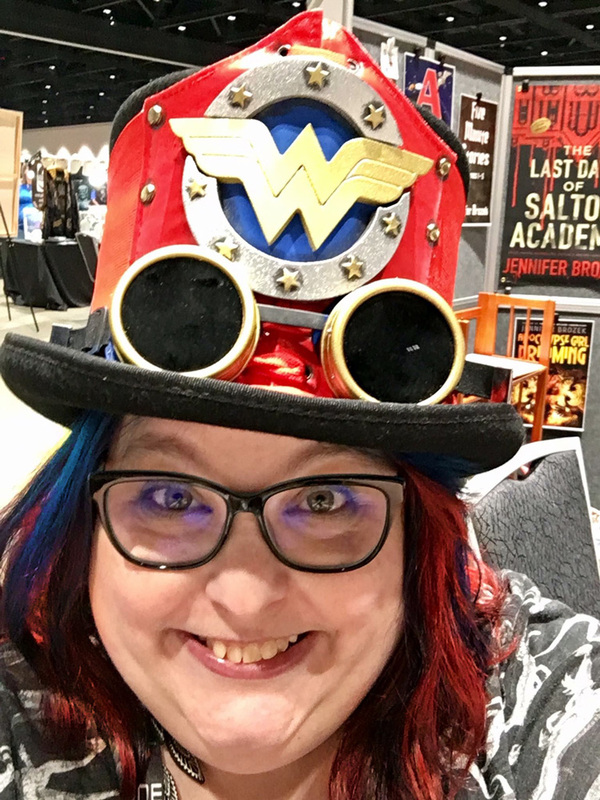 For those who don’t know, Worldcon is one of the largest and oldest science fiction conventions in the world (hence being called Worldcon). 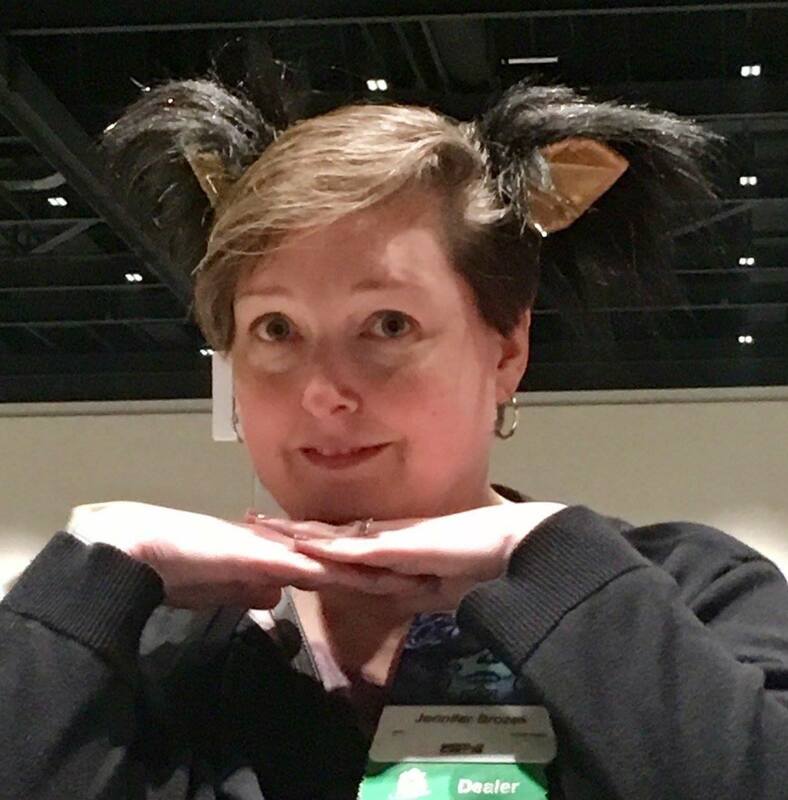 In fact, this year was the 76th Worldcon! 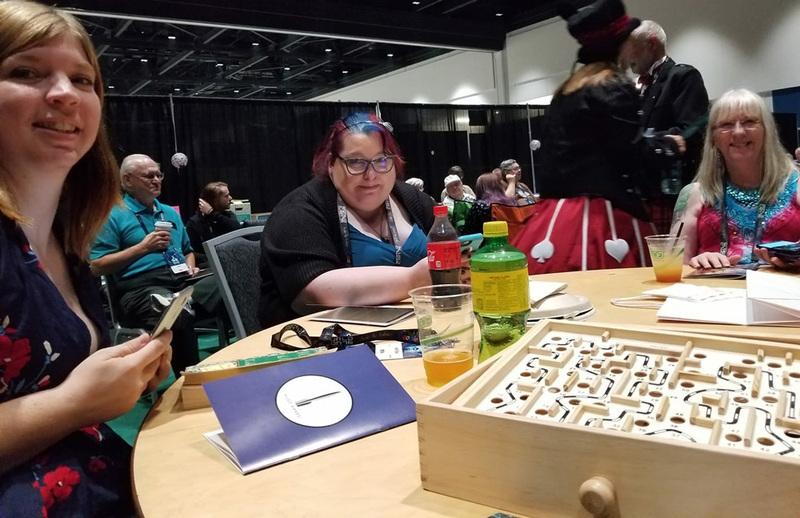 The last Worldcon I attended was in 2015, in Spokane, WA. 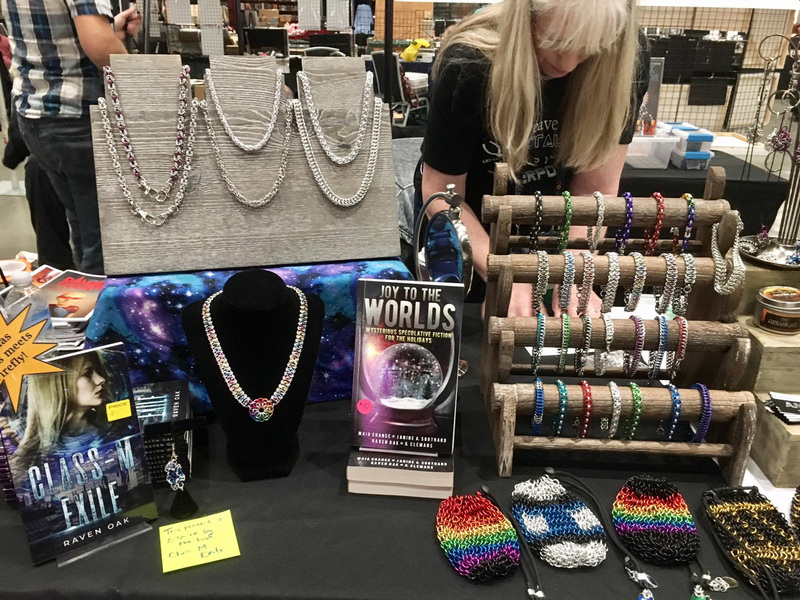 (I was going to originally attend the Worldcon in San Antonio, TX, but we moved to Washington state and I missed it.) 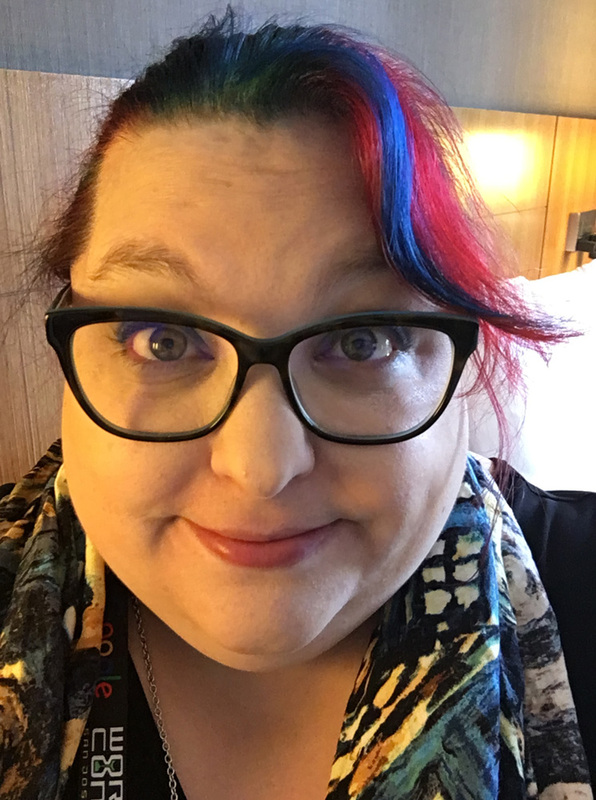 Worldcon isn’t always in the United States, so when it is, much less on the same coast as me, I tend to go! 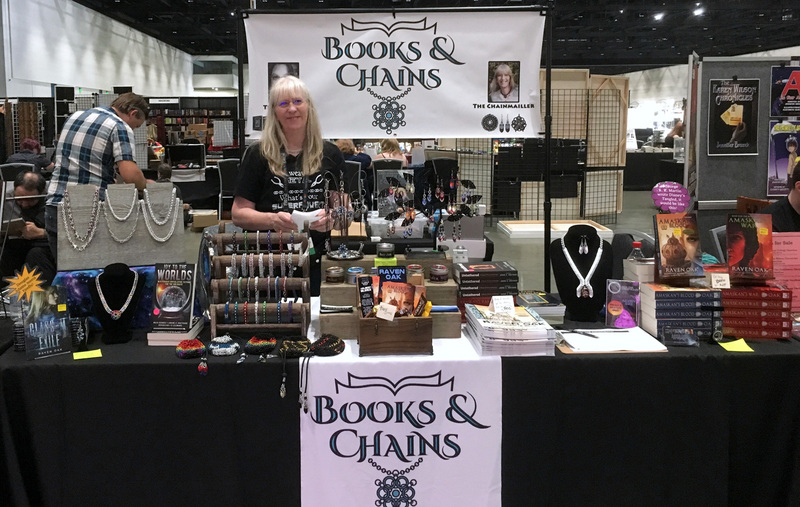 Books & Chains was vending this Worldcon so rather than go as an attendee, I was there 100% for business. 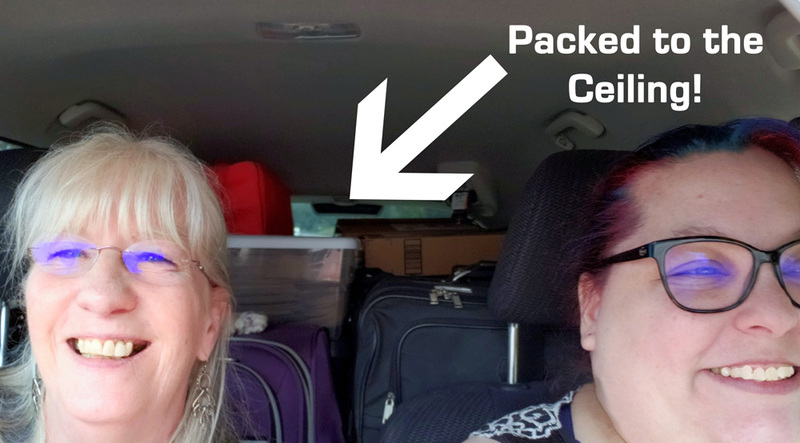 This meant that Elise and I were going to take the two-day drive down to San Jose, California, vend for the five days of Worldcon, and then make the two-day drive back home. This is me, bright and early on Tuesday morning at the beginning of our journey. 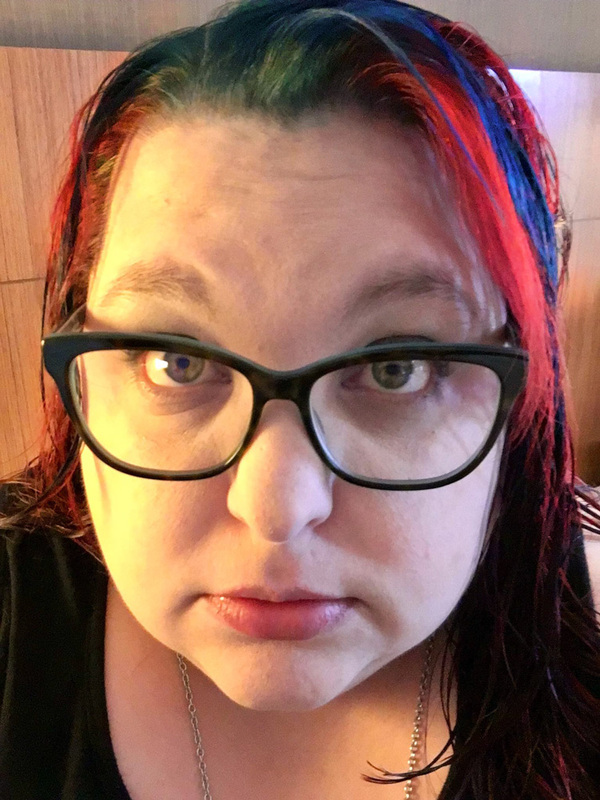 I look so much more awake than I did by the end of this. 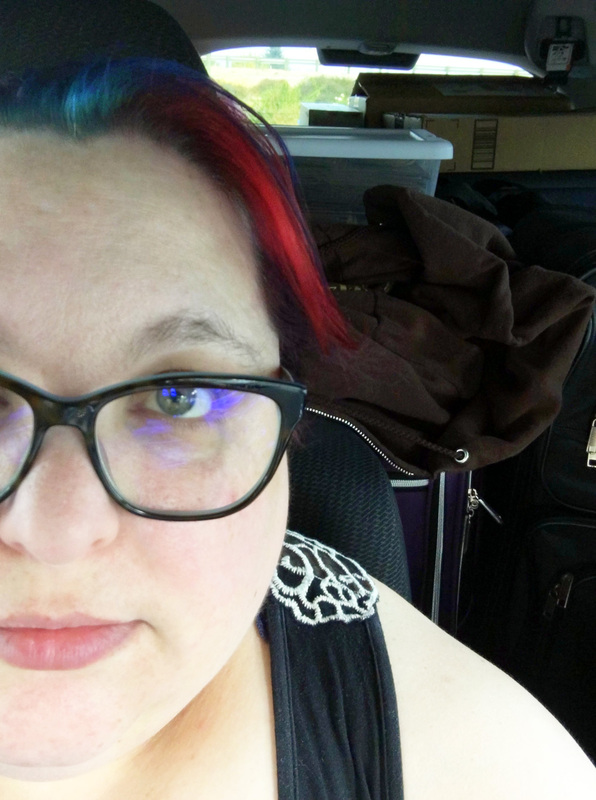 You can see in the photo above just how packed my Honda Fit is at the start of the two-day drive. That’s Elise on the left. 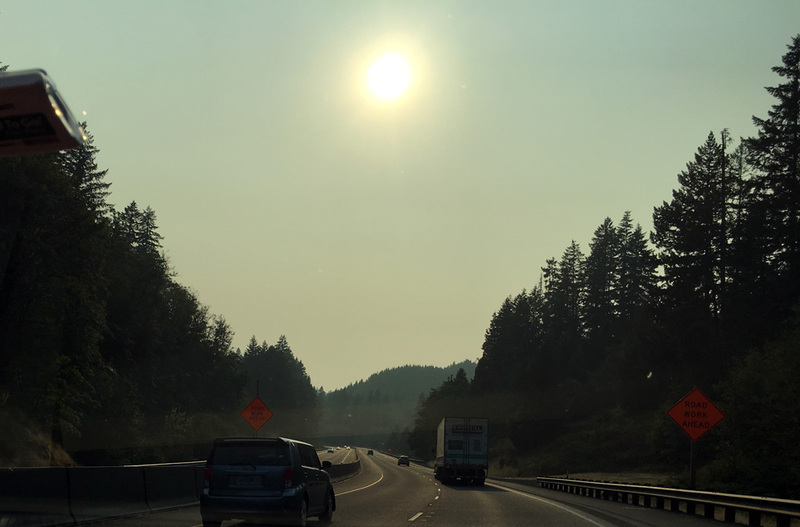 Even as we drove towards Portland, OR, the wildfire smoke was already obscuring the sun. 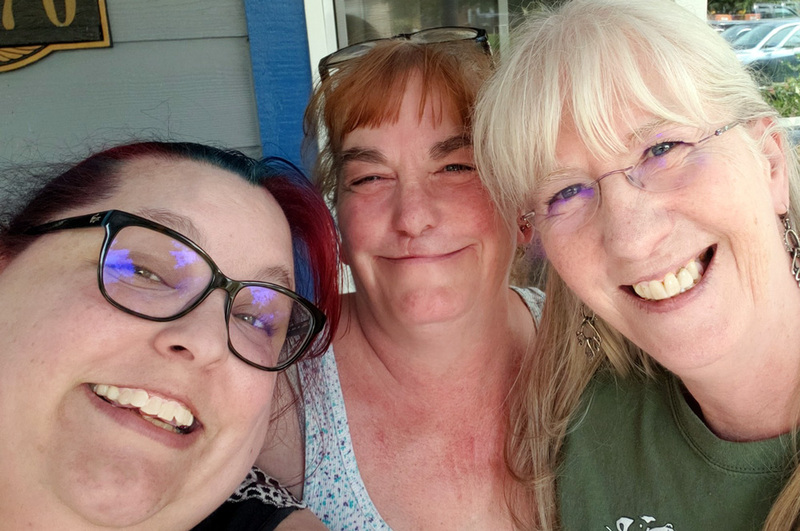 When we reached Portland, we took a brief stop to say hello to Elise’s sister, Sue, and have a break in the A/C. We discovered part-way down that my A/C had died. It was 95 outside and way too hot for a drive with no A/C, let me tell you. The closer we got to Medford, OR, the smokier it became. Medford, OR was our stopping point for Day 1 of the trip. We had a very late dinner at the Common Block Brewing Company, which has one of the best vegetarian burgers I’ve ever had. (See the Herbivore on the menu below!) 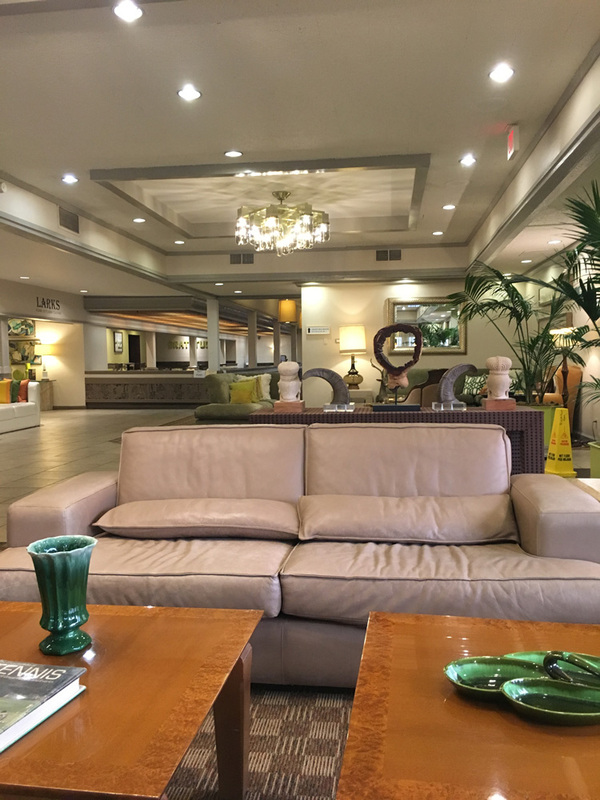 After dinner, we checked into our hotel, which had a very nice lobby. The rooms weren’t anything to write home about, but they were decent enough for a night. 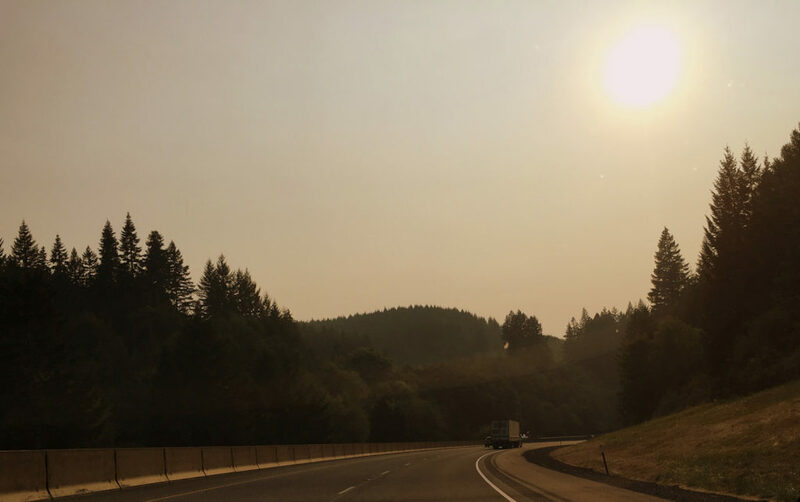 Medford was smokier than Redding, if you can believe it. 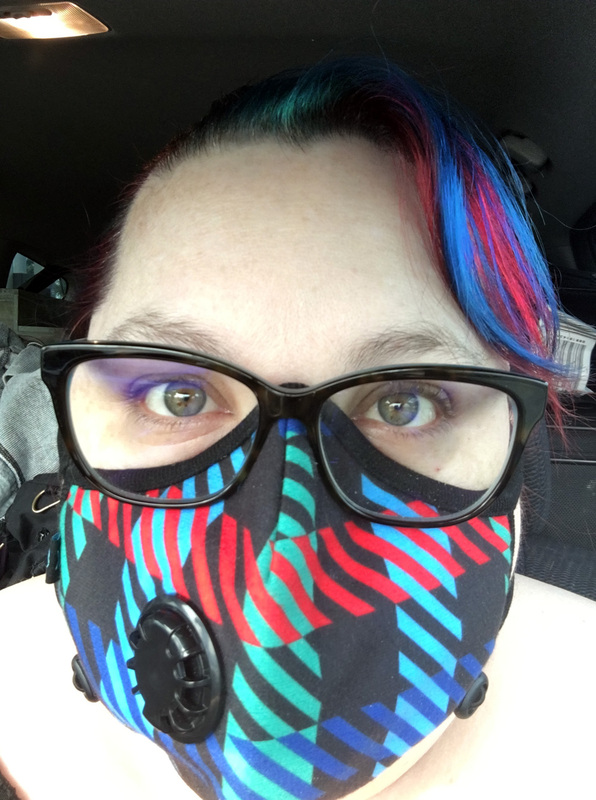 Because of this, I wore my mask any time I was going outside as my lungs were not happy about the smoke. After crossing the border (and being stopped to ensure we weren’t bringing any produce or plants into the state), we drove up and down mountains in California. 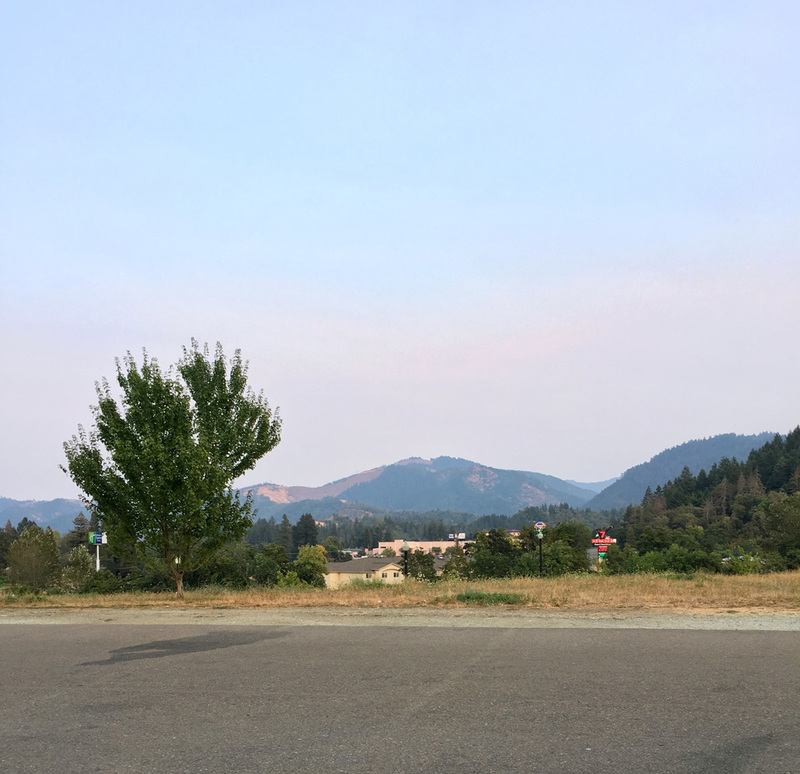 We stopped at a brief rest stop (pictures below) where you can see that the smoke cleared up a bit. Another shot from the rest stop. 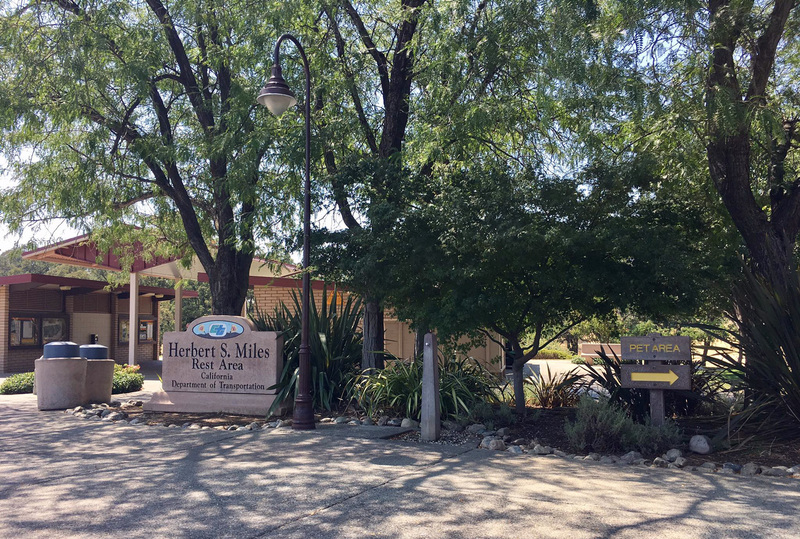 We arrived in San Jose in the late evening after a nearly 9 hour drive. Once our stuff was in the convention center, we checked into the Hyatt across the street, had a quick dinner, and went to sleep. Morning would come soon enough…as it did. I am not quite awake yet in this picture. Thursday morning we set out for the con to set up our booth. 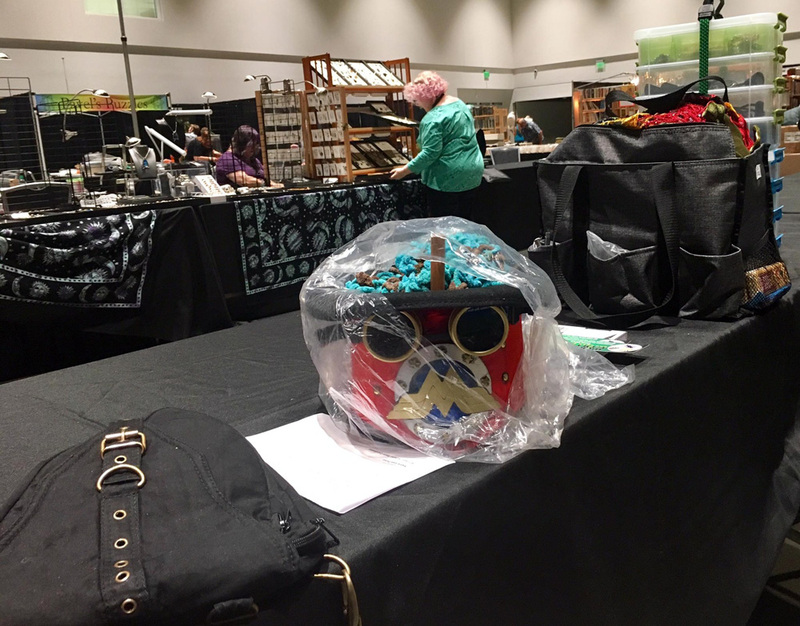 The dealer’s hall would open to the convention at noon, so we had about three hours to set up. We got some new display stands, which you can see in the pictures below. 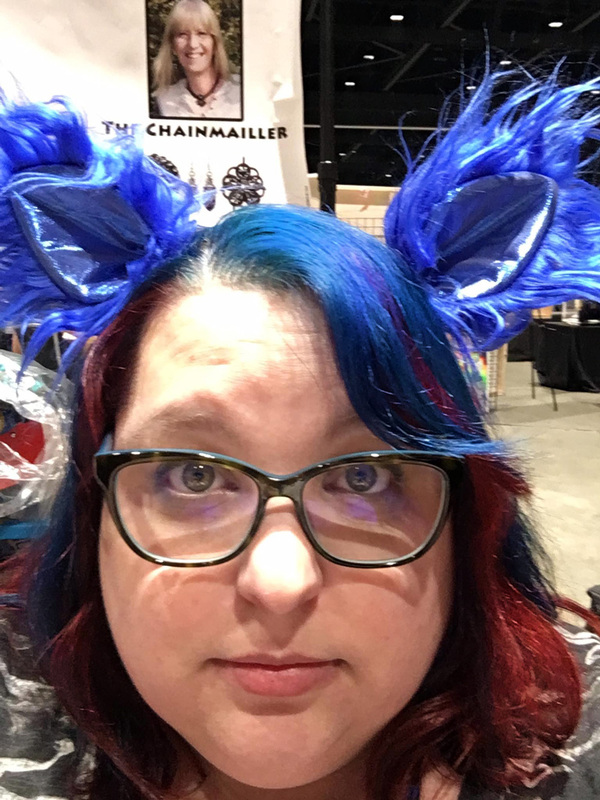 In the picture below, you can see Elise’s NASA chainmaille piece. The silver scales were leftover from those created to protect the NASA Insight Rover’s seismograph, which launched for Mars this past May. 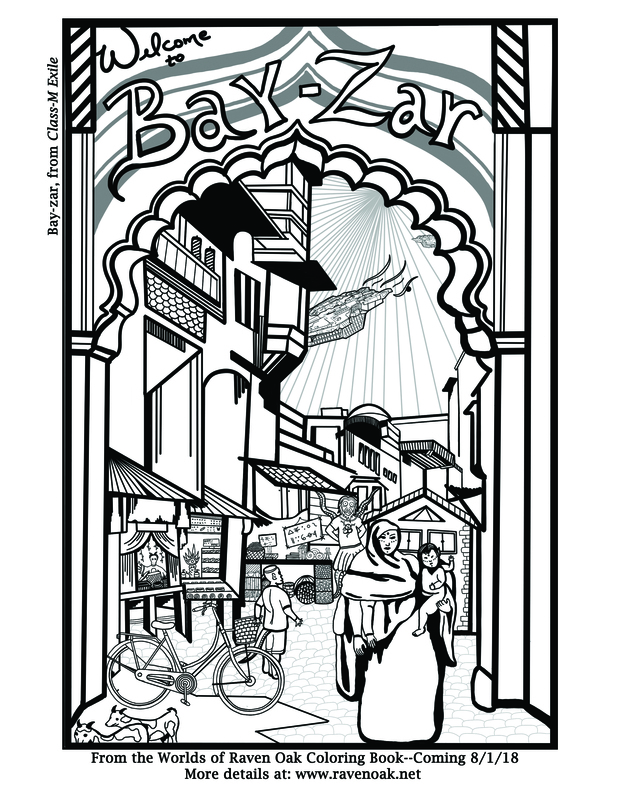 This special piece of history sold rather quickly! You can also see my new titles on the table. Here’s a full picture of our booth. Rather than the normal 10×10 space, we had one 8′ table, so we had to sort of cram everything in where we could. Below is a picture of me on Thursday. I got this hat to block the bright convention center lights. They tend to give me a migraine. On one side of our booth we had author and game maker P.A. Wikoff, and on the other, good friend and writer, Jennifer Brozek. A couple of booths down were Hyfriends Patrick Swenson with Fairwood Press and Tod McCoy with Hydra House. In other words, we were on a good row among friends! 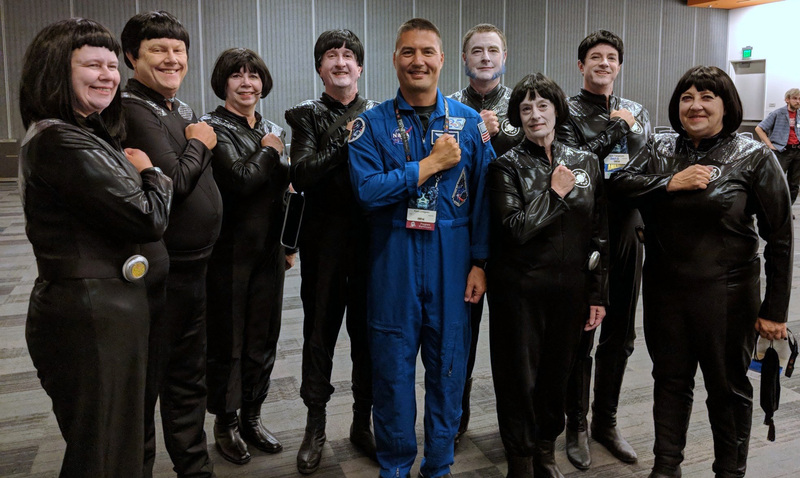 The highlight of Thursday was when astronaut Kjell Lindgren (pictured below) stopped by our booth. He was admiring the NASA necklace, which we told him about, and we had a lengthy chat about the space program and International Space Station. I thanked him for being an astronaut because they are one of the reasons we science fiction authors write. 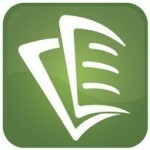 We’re often writing about what they’re doing. Kjell thanked me and said he was an astronaut because of science fiction authors like me. He read lots of sci-fi books as a kid, which made him dream of going into space. Kjell thanked me and said he was an astronaut because of science fiction authors like me. He read lots of sci-fi books as a kid, which made him dream of going into space. 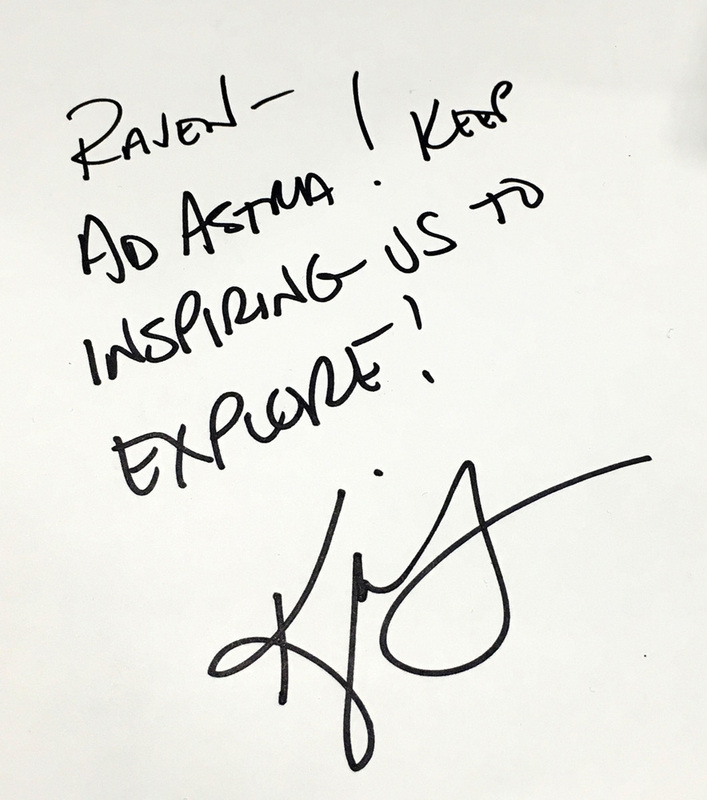 He signed the back of one of my coloring book pages, the one featuring Bay-zar from my sci-fi novella Class-M Exile. 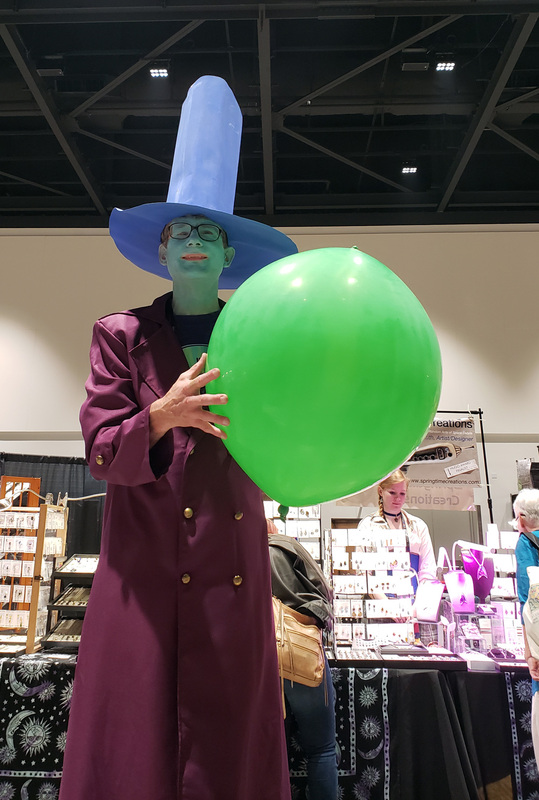 During the five-day convention, we saw a lot of cosplay, or “costuming” as some of the older generations call it. 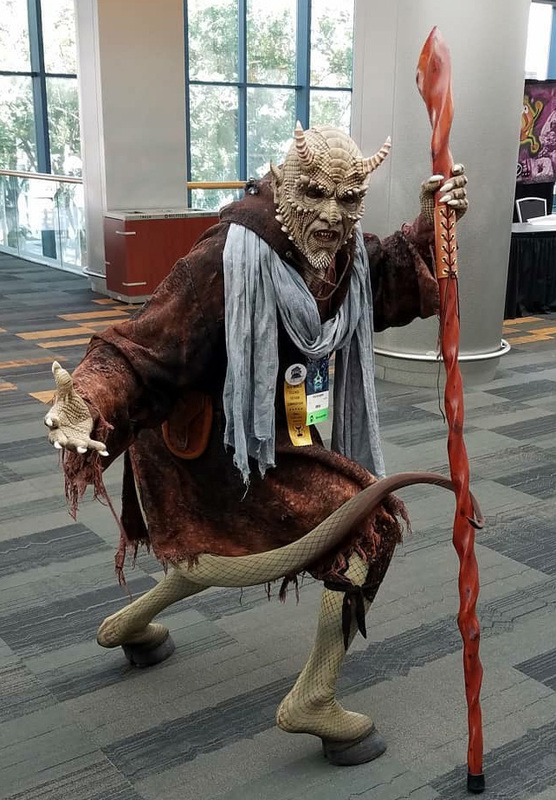 This Krampus below had eerie bells and was staying on the same floor as friends of mine. When he walked to the elevator, everyone could hear it. 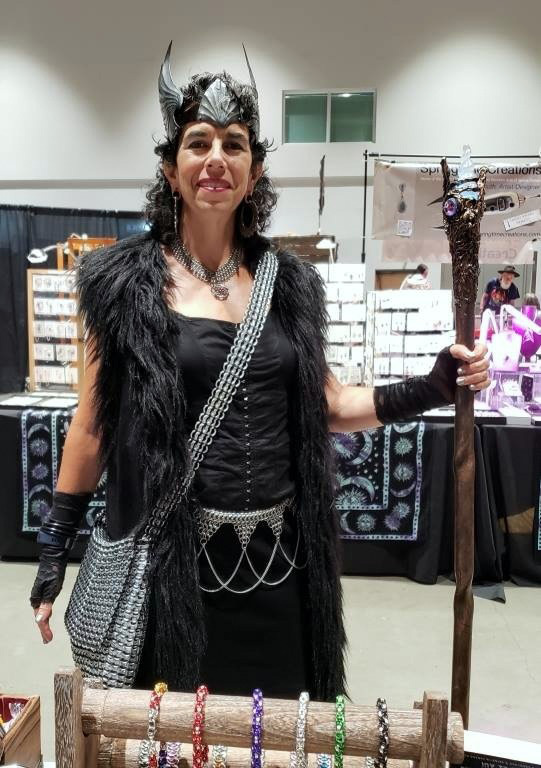 While this woman’s outfit was gorgeous, she refused to wear her Worldcon badge. Not cool. I know no one wants to mar their outfit, but for security reasons, especially with protests planned outside, wear the damn badge. 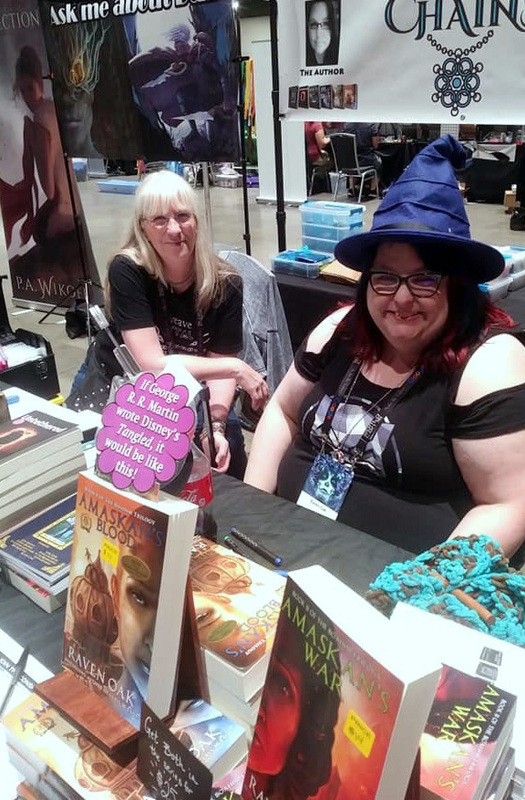 Here’s another shot of Elise and I at the booth! This guy was REALLY tall. I love the shades. Totally makes the outfit. 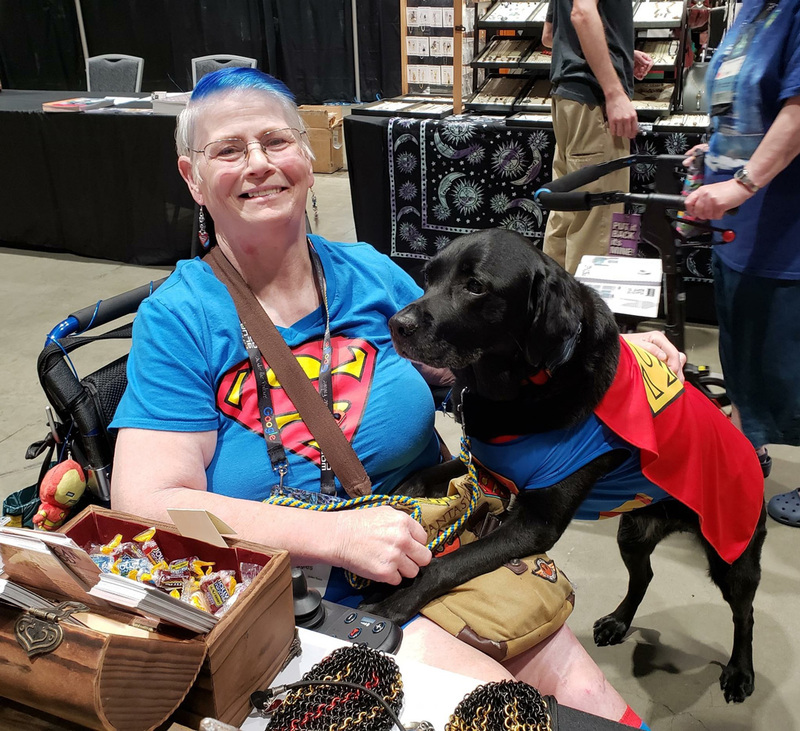 My friend and gaming crew member Kelli stopped by, along with Tammy, who’s pictured below. 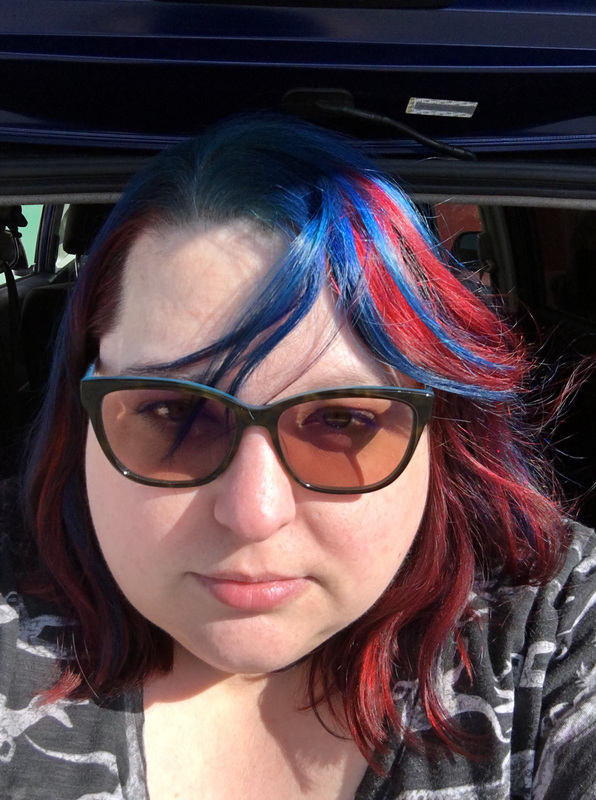 (Thanks Tammy for the awesome selfie!) 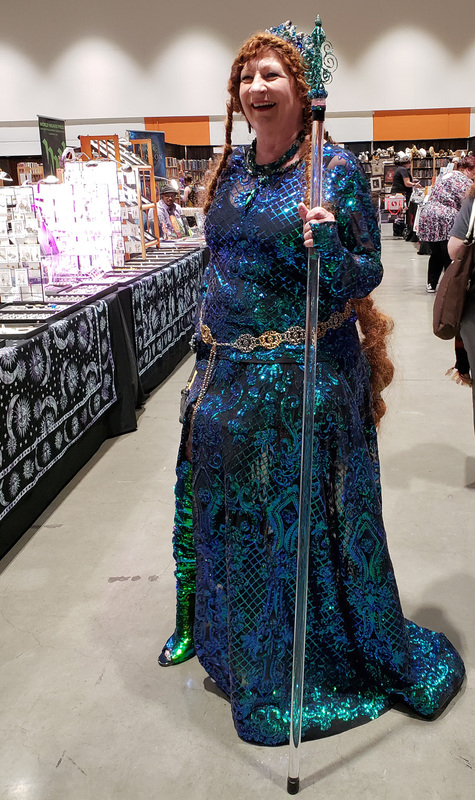 This woman’s fae outfit was gorgeous. This photo doesn’t do it justice. 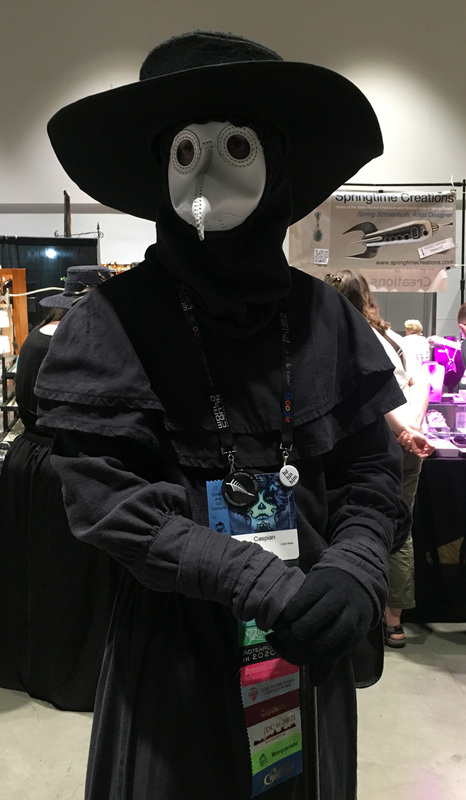 I love plague doctors. Must be my love of Bioshock coming through. 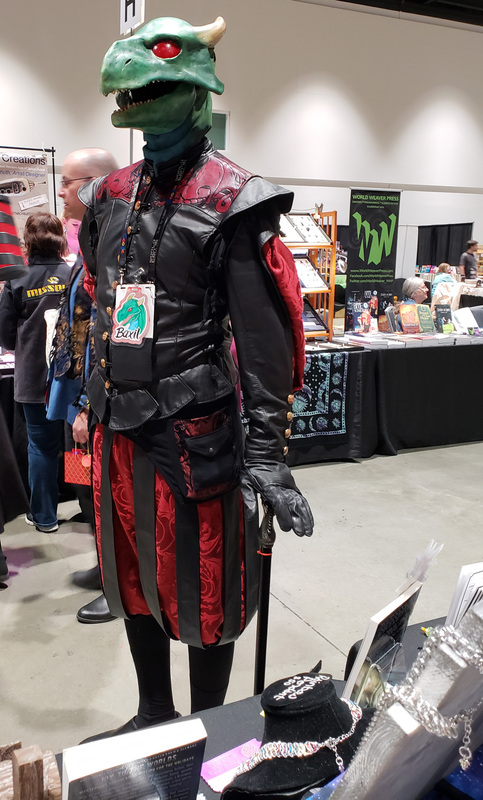 I love the detail on this guy’s leather work. The details on her outfit were amazing. 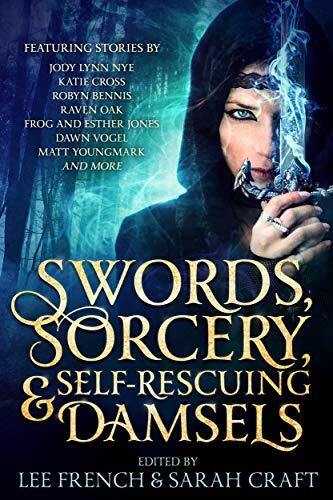 His sword was huge–easily as tall as he is–and yes, it glows. On Friday, I wore my exploding TARDIS outfit. In this photo, I’m way too tired. This is my “prop-my-eyelids-up-with-toothpicks” look. 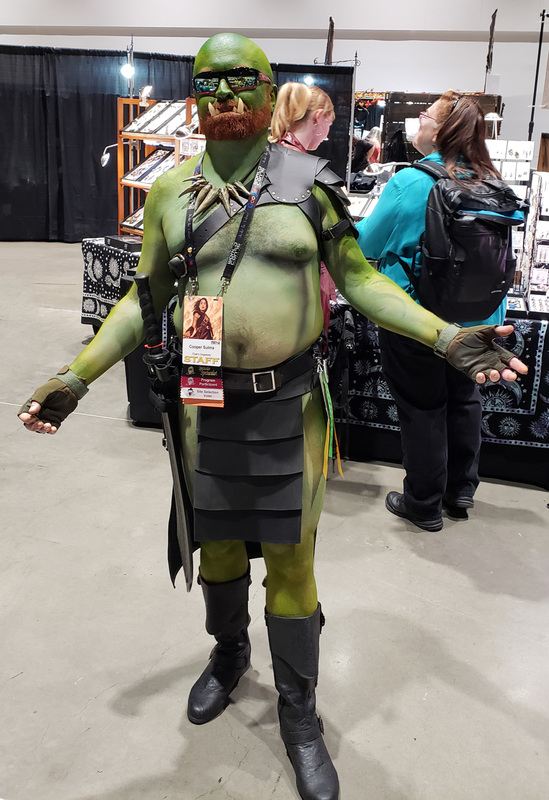 The detail work on this cosplay is unreal. We loved this woman’s superhero outfit. Even more, we loved that she included her service dog! 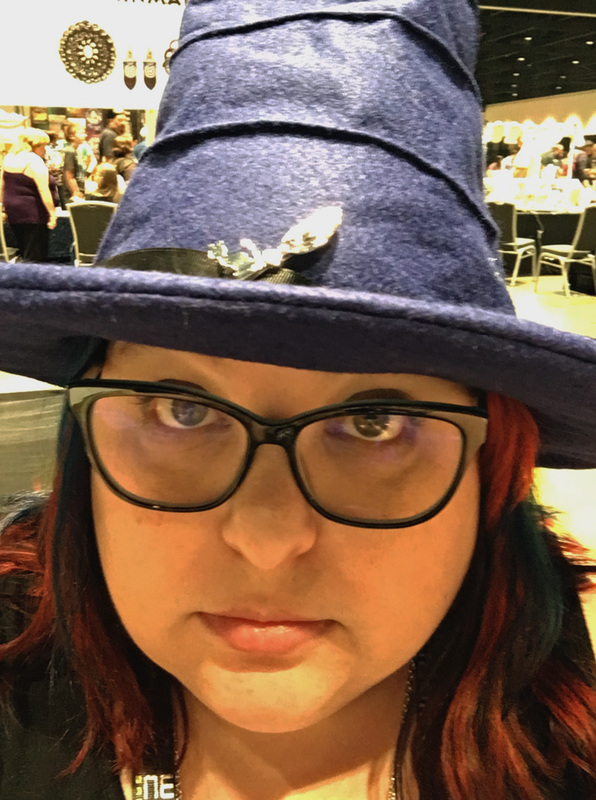 Sunday evening was the Hugo Awards–basically SF/F’s Oscar Awards. 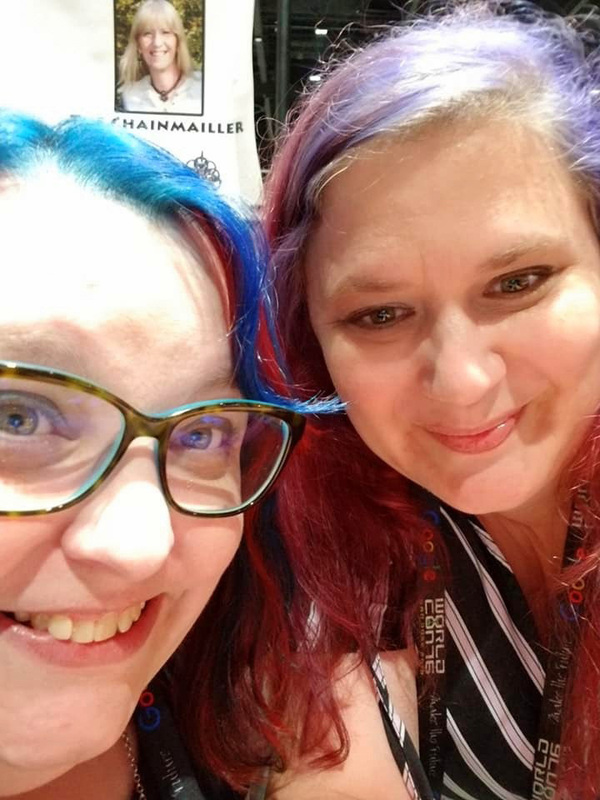 Rather than go into the ceremony itself this time, we set out for Callahan’s Bar to see the live stream of the Hugo Awards. These shots are of our table before the awards. (The shot above was taken by my friends Tammy who is pictured in the shot below.) We had several other friends join us at different points of the ceremony. My skirt had a galaxy pattern that twinkled like the stars. 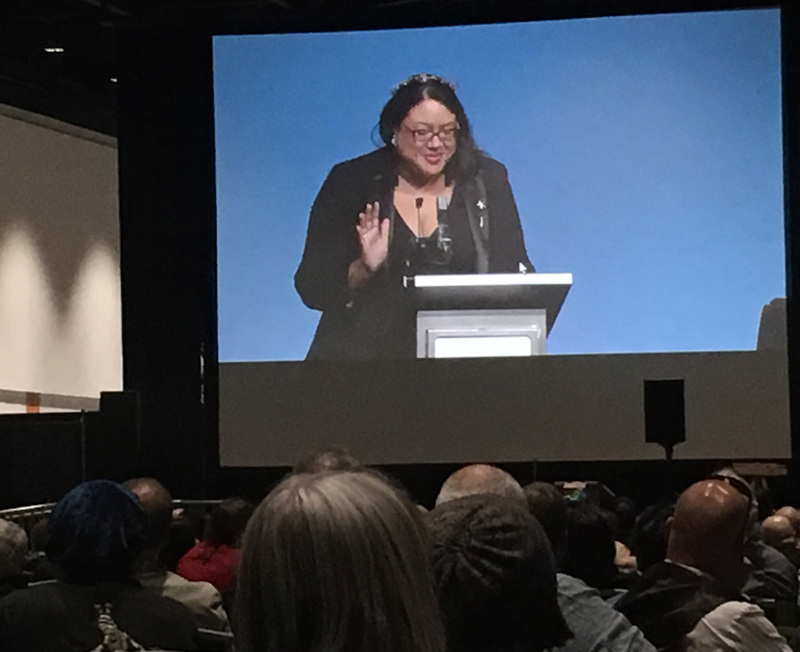 After a mild delay, the Hugo Awards began. 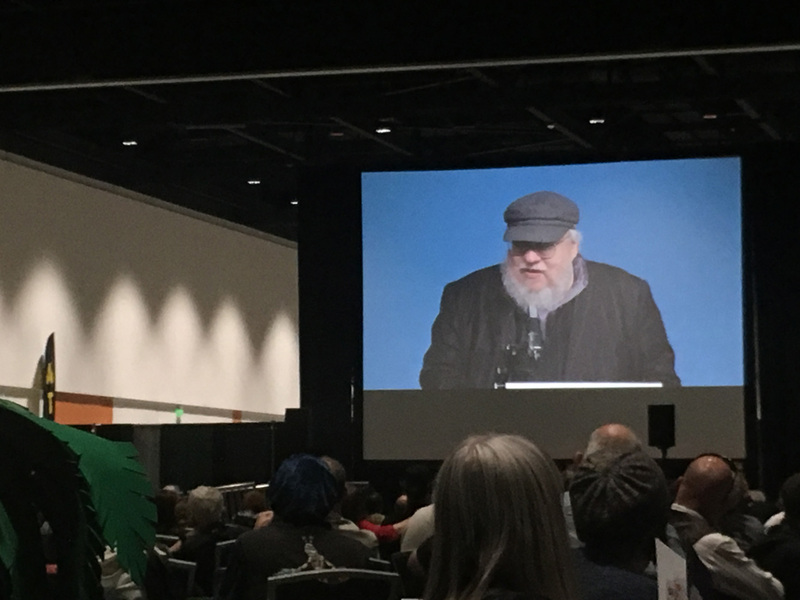 That’s George R. R. Martin announcing one of the awards. This is Rebecca Roanhorse, who is both a woman of color and of the Native Peoples. She won two awards that night! 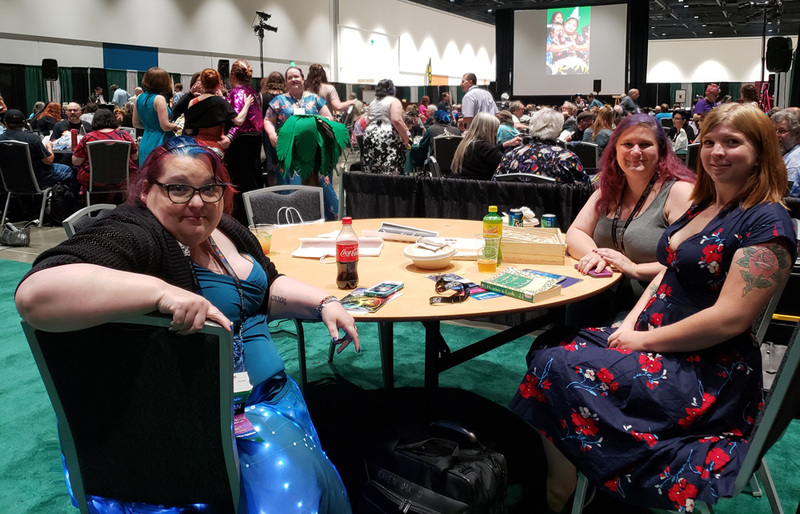 I loved seeing women dominate the Hugo Awards! Way too often, women are told they can’t write science fiction. In fact, I encountered such an attitude earlier on Sunday by way of an editor (more on that at a future date). Nora Jemisin (N.K. Jemisin) had an amazing acceptance speech for her award–the best of the night. 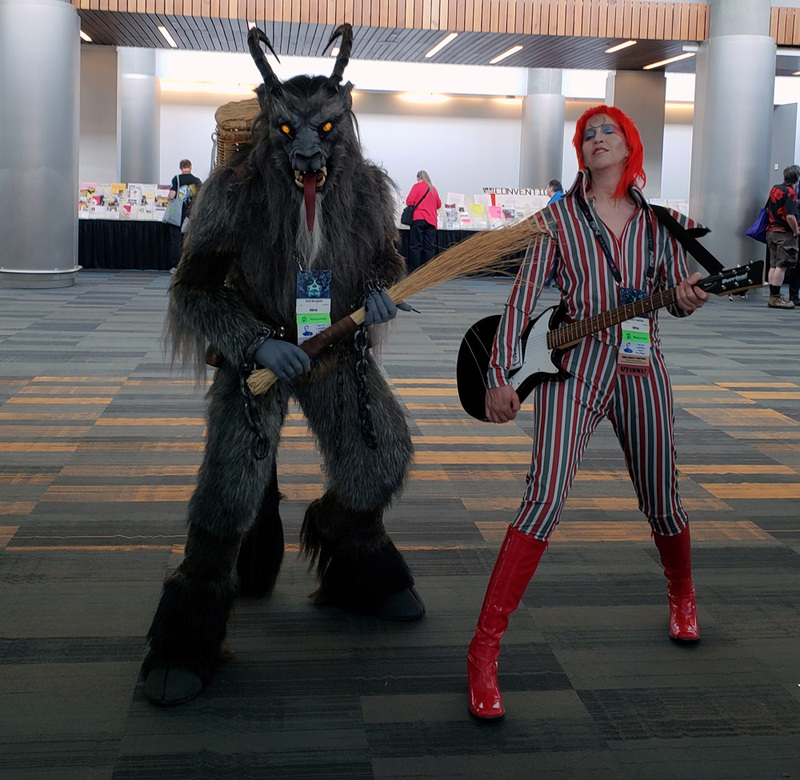 It was odd having a Worldcon go from Thursday-Monday rather than its usual Wednesday-Sunday and as such, Monday was rather quiet. Very few attendees and fewer sales. Since Monday was quiet, things got a little goofy in section G.
And then there were ears. 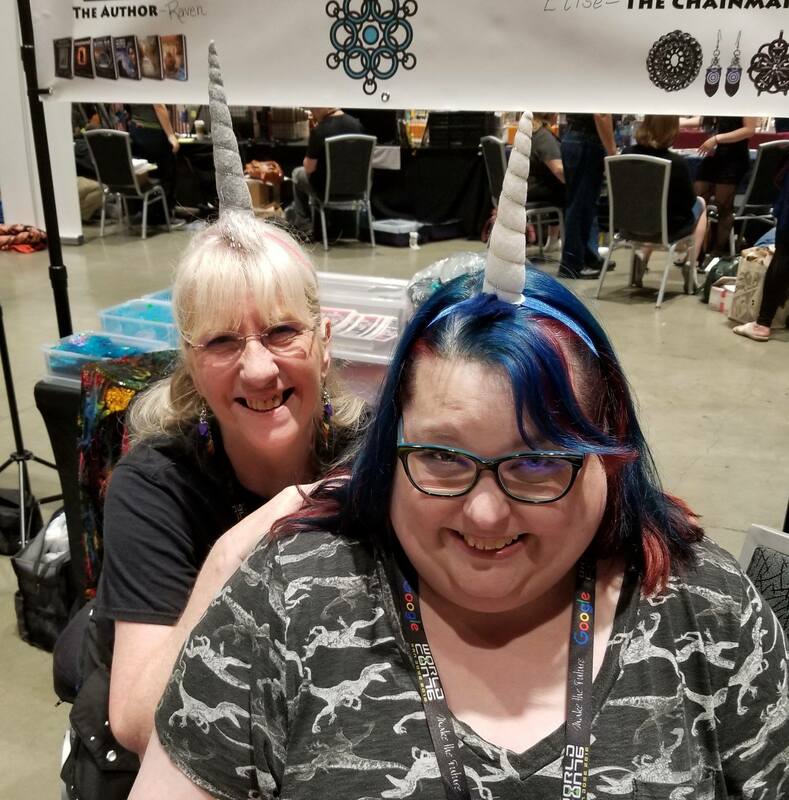 We tried to get Jennifer Brozek (who had a booth next to us) to wear a horn, but she wouldn’t. So we got her ears instead. I also picked up some Tribbles from David Gerrold,. who was on the row behind us. I’ll have to add pictures of them later. What’s funny is that they shake/vibrate and make Tribble noises. My cats dislike them and attack them if they vibrate! For all that Monday was slow, it went fast. Soon we were packing up to go home. 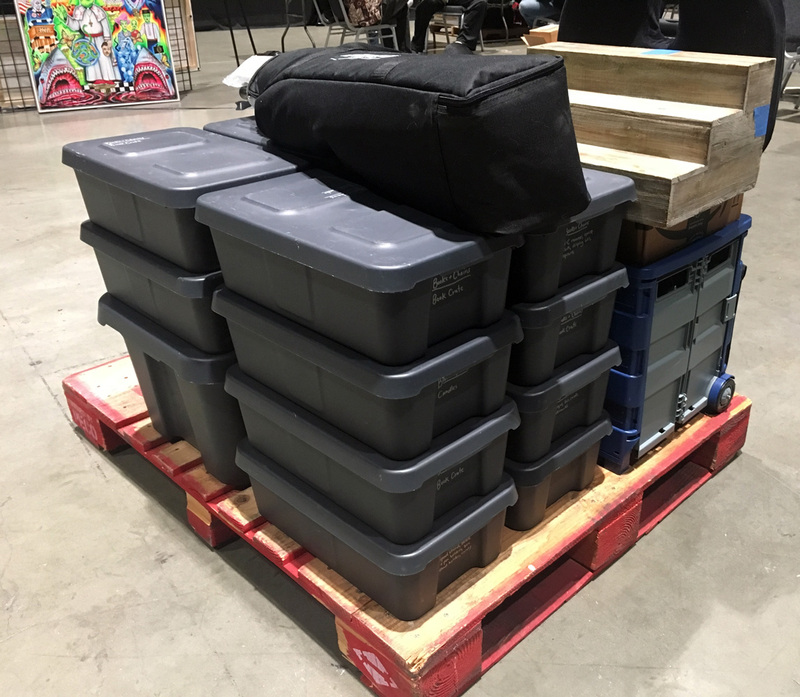 Below is our entire booth, all packed up and ready to go! After getting everything on the palette, it was time to pull the car around into the loading dock. One last day in the California sun! Yes, those are dinosaurs on my shirt. We left Tuesday morning and for whatever reason, my GPS routed us through San Fransisco. 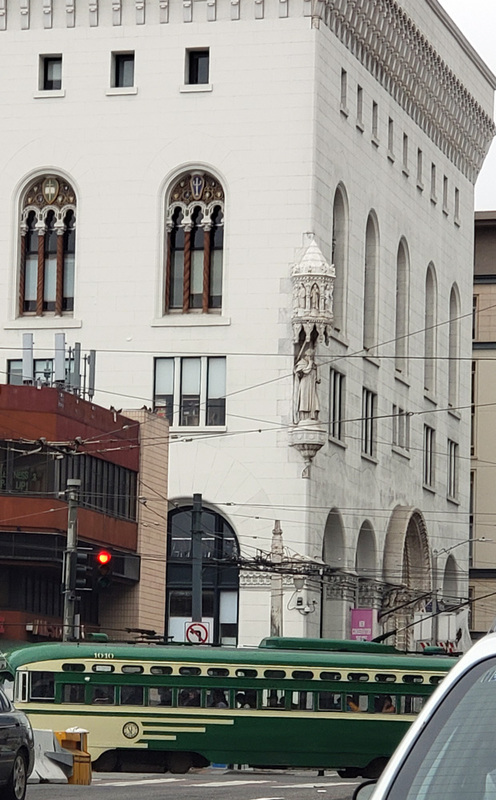 I love the architecture in that city! 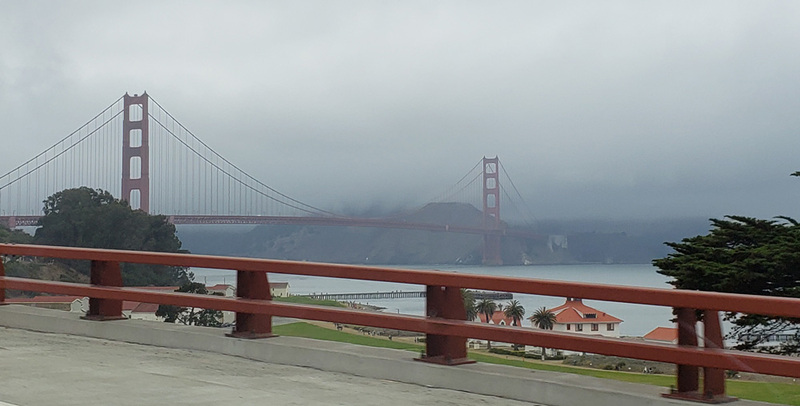 I got to drive across the Golden Gate Bridge for the first time in my life! These pictures are as we approach the bridge. 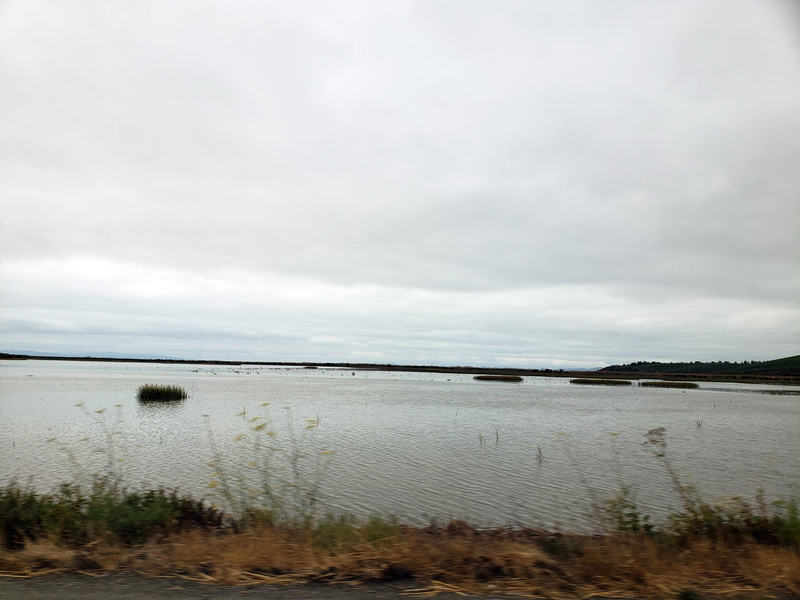 After we left San Fransisco, we crossed a lot of water that reminded me of the Everglades in Florida. About the time we stopped for lunch, we took some photos of palm trees. I don’t miss the heat of Florida or California, but I do miss the palm trees. 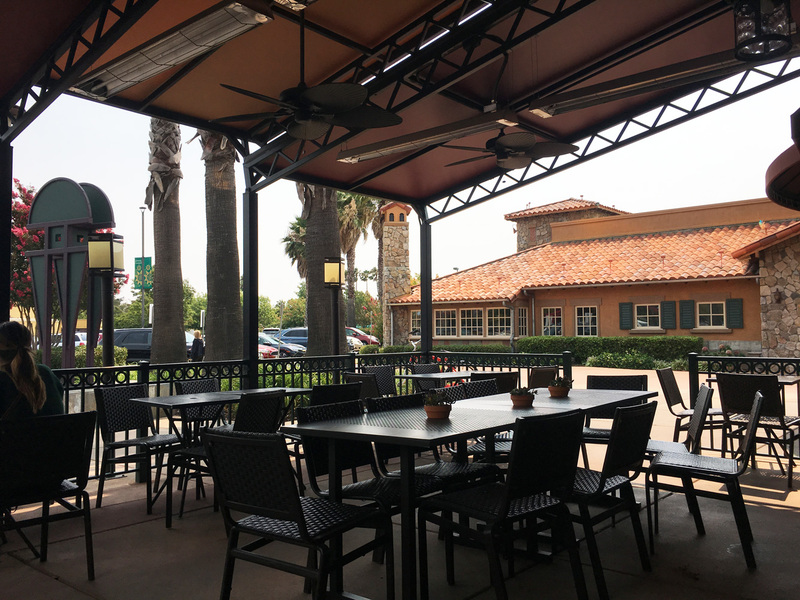 It was a nice and breezy 63 degrees out when we stopped for lunch. 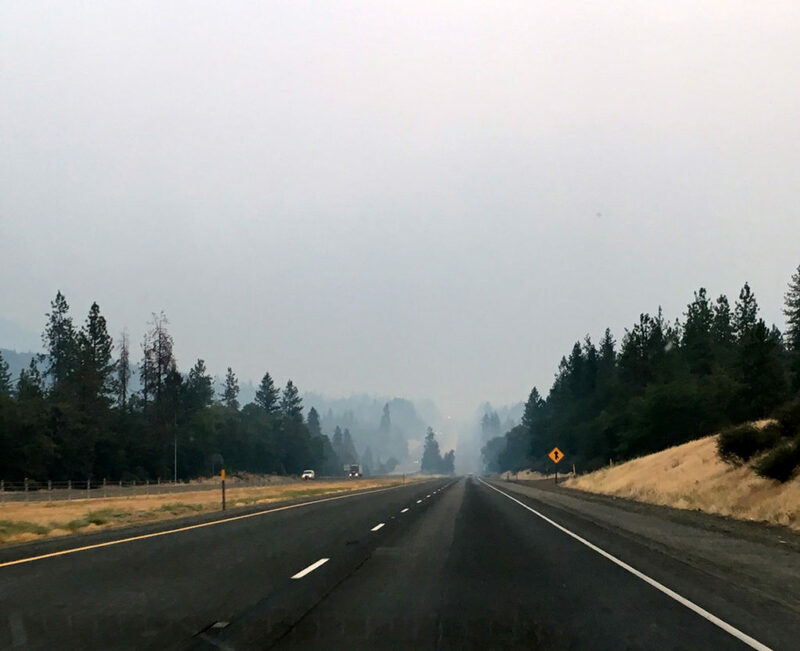 As we were driving back towards Seattle, our friends and family were keeping us updated on the horrific smoke in the area. 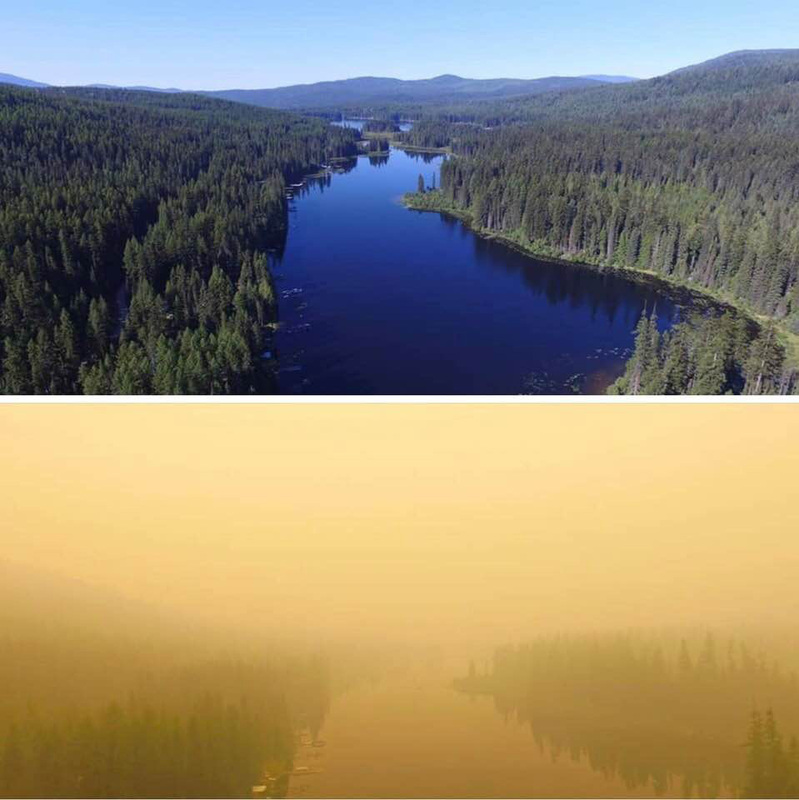 Below is a great example of how bad the smoke was from all the wildfires. 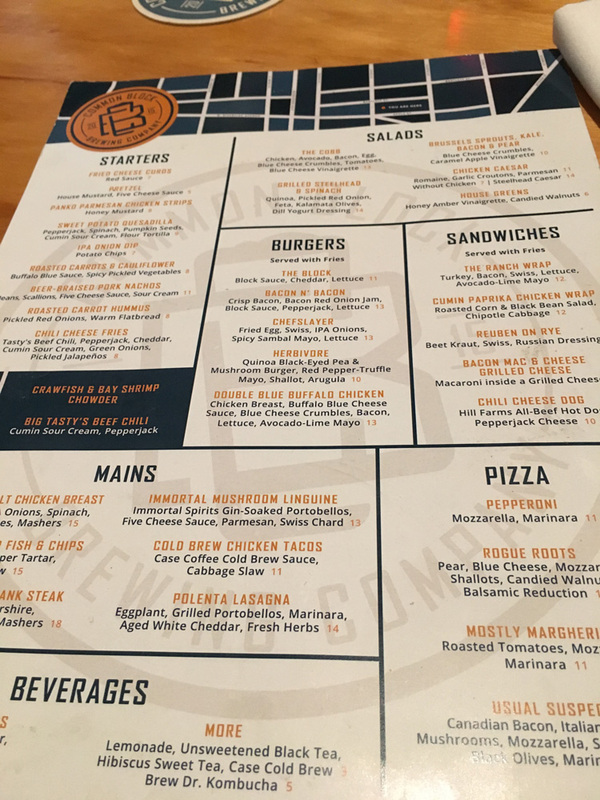 When we stopped again in Medford, OR, we returned to the Common Block Brewing Company for dinner. 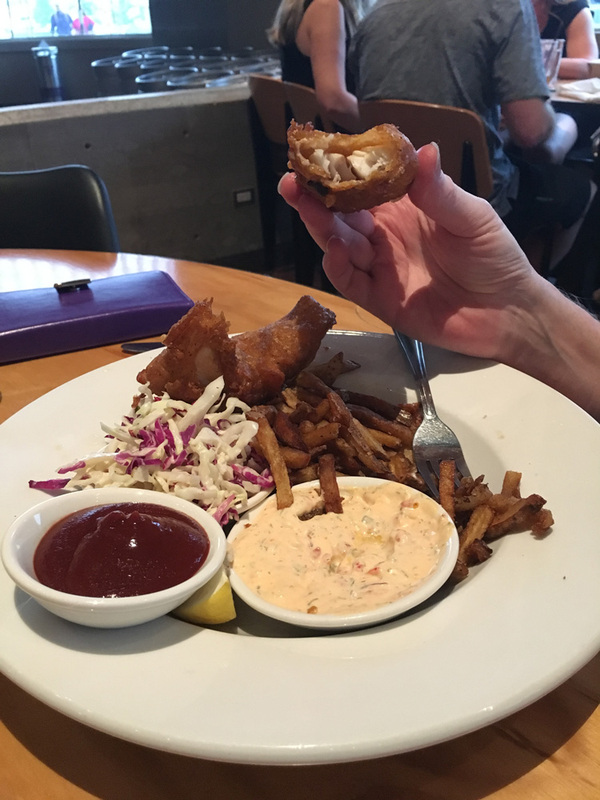 Elise had their fish & chips. 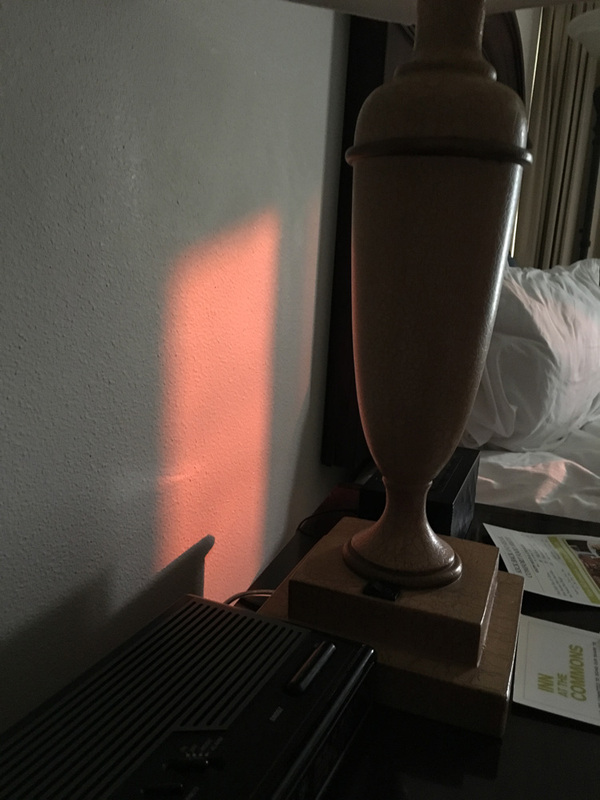 When we woke up on Wednesday morning, the red sun cast red squares on our hotel room wall. 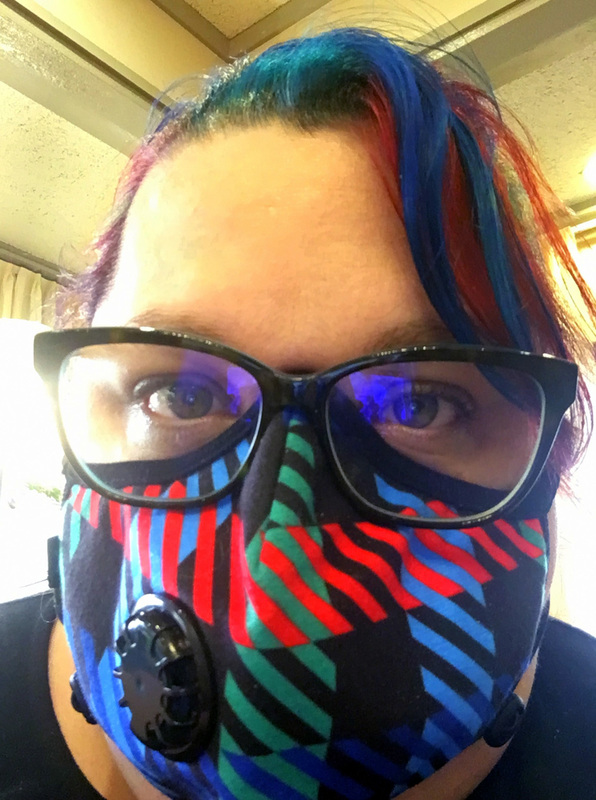 It was time to wear the mask again. 🙁 It was a long drive home, but once there, my kitties were so happy to see me. 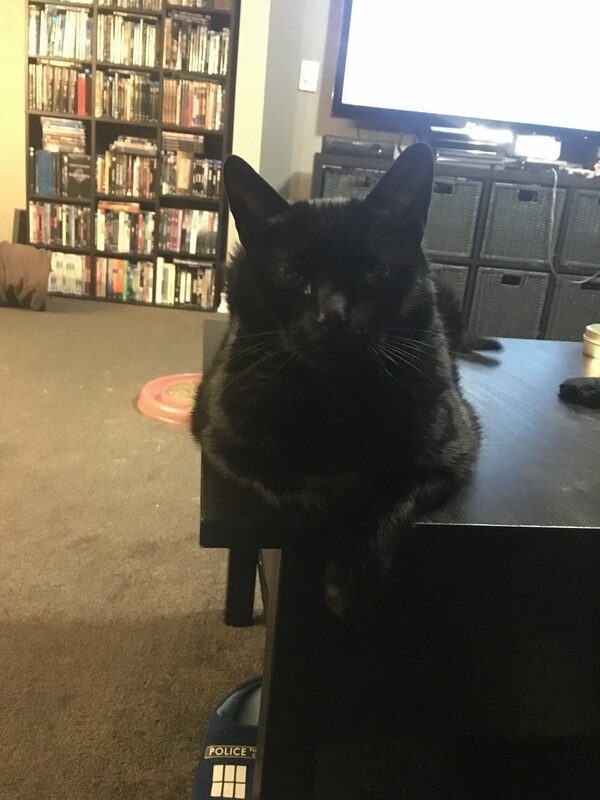 DiNozzo sat on the table in front of me and refused to leave my side. It’s good to be home. Unless noted, all photos taken by Raven Oak and/or Elise Kreinbring. Copyright 2018.